Anyway, too many straight contemporary romances on my list, so this looked a treat and it was ( except for that ending!!) Its really well written, Mae is a great lead character, and the main thrust of the book is the journey through the woods with Casimir the prince, for her to take revenge on those who killed her father and for Cas to rescue Ellen who he thinks is the Craft-Born and is to be his wife. To begin with there’s lots of friction between Mae and Cas, he sees her as rude and uncouth and she sees him as a spoiled, pampered prince. The journey takes some time though, through dangerous woods and along the way they both learn more about themselves, and see each other in a different light. Mae is still trying to hide her powers from Cas, she doesn’t want the burden of becoming Queen, especially when Cas is so besotted with Ellen. Even though she’s come to feel a lot for him she won’t be second best, and if he knew the truth he’d have to marry her instead of Ellen. They face real threats to their lives and each rescue each other a few times, Mae still hiding her powers, though in truth she’s so rarely used them that she doesn’t know much about what she can do. 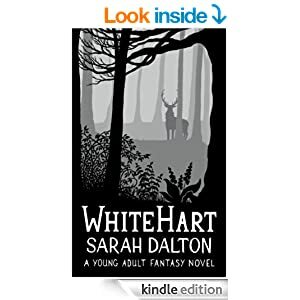 I really enjoyed this getting to know and appreciate each other time, and the way Sarah avoided the all too common ploy of having the heroine use some new and unknown talent to get them out of danger. Mae does use her powers at times, but we’re talked through it by way of her thoughts and can see that she’s struggling with how to do it, and how to keep it hidden from Cas. They meet other people along the way, and face danger from them too when they see Mae riding Anta, her white stag. He was perfect, he’d been with her since birth and made the mystery of her birth and heritage so much more uncanny. In all a terrific read, one I’d re read and one that all age groups can enjoy. I wanted to smack Cas at times for not appreciating and seeing Mae for what she is, rather than just the peasant she appears, though he does come to regard her as his best friend. Knowing how she’s grown to feel about him, I was really hurt for her at times when he’s talking about her future where she can perhaps marry a baker or something! Jerk….I just want him to see and love her for herself, and not the milkweed Ellen, ambitious, pretty but vacuous IMO. Then there’s That Ending…..and I’ll say no more on that 🙂 Its what’s brought my star rating down, as I’ve no idea on how long we have to wait and how many more books.